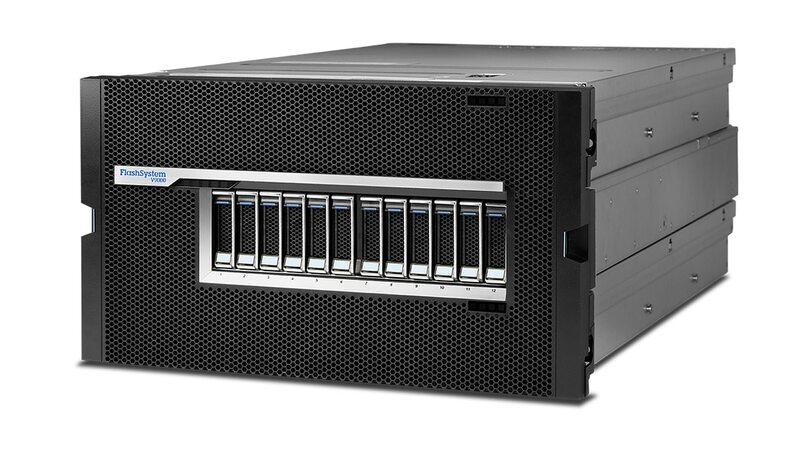 IBM FlashSystem® V9000 is a comprehensive, all-flash enterprise storage solution providing the advantages of IBM Spectrum Virtualize™ software at the speed of flash memory. You gain the high performance, ultra-low latency, superior efficiency and enterprise reliability of IBM FlashCore® technology. A rich feature set includes compression, deduplication, dynamic tiering, thin provisioning, data copy services and high-availability configurations. This highly scalable solution allows you to expand your storage as your business grows. Discover how FlashSystem V9000 performs better, costs less and integrates more easily than other solutions. Transform data storage economics and maximize efficiency. Reduce your capital investments today and lower your operational expenses for years into the future. Speed insights with IBM FlashCore technology and IBM-enhanced 3D TLC including hardware-accelerated architecture with NVM access, IBM MicroLatency® modules, and advanced flash management capabilities. Deploy IBM Spectrum Virtualize features across FlashSystem V9000 and external virtualized storage: dynamic tiering, thin provisioning, data copy services, data reduction, and high availability. Combine Tier 0 & Tier 1 storage to support mixed workloads. Achieve the highest performance where you need it and save money where speed is not critical. Match systems to your workloads with scale-out and scale-up capabilities for capacity and performance respectively, to grow your storage with your business. Gain agile integration. FlashSystem V9000 integrates with VMware vStorage APIs for Array Integration (VAAI) and VMware vSphere APIs for Storage Awareness (VASA), as well as VMware Virtual Volumes.